Testing is crucial to ensure high quality products are delivered to customers. Few things are more frustrating to a customer than an ‘out-of-box’ or premature failure due to an avoidable fault. Thankfully board assemblers offer multiple layers of testing and inspection to ensure high-quality, assembled boards are produced and delivered to customers. Emphasis is on prevention through rigorous quality management rather than cure by rework. This is an integral part of a board assembler’s Quality Management program. Despite all efforts to prevent errors, board assembly is a complex process and defects sometimes occur relating to a variety of issues from incorrect component loading to failures in SMT equipment. Thorough testing and inspection occurs throughout the production process to ensure problems are captured early on, ensuring high quality and yield. Visual inspection is a vital element in ensuring problems are captured and corrected as early in the process as possible, reducing the time and cost associated with rework and wastage. This is conducted manually using high power microscopes or as part of the process flow performed by machines. Visual inspection begin with the solder application. Inspection at this stage checks for correct deposition of solder paste on pads to ensure components reflow properly. Here testing helps prevent solder bridges, open circuits or fragile joints prone to failure. 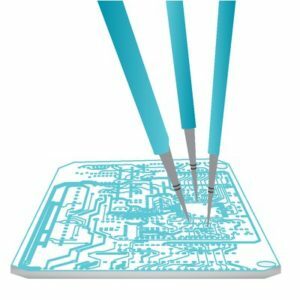 Jet paste printers are particularly effective at accurately applying solder paste in small-scale prototyping and manufacturing due to their extremely fast setup and quality output. Pre and post reflow inspection are important elements in quality control. Pre-reflow inspection catches placement errors at a point where they are easy to repair, avoiding repetitive mistakes early in the process. This is important with products like automotive boards where regulatory compliance require that boards cannot be reworked. Components and boards are heat sensitive and detection of errors at this stage can avoid their damage or destruction. It is a vital point in inspecting boards prior to reflow of encapsulating RF shields that shadow components once soldered down. Post-reflow inspection can be manual or with AOI. Reflow errors can be mitigated by thermal profiling of a test board. This is a destructive test as BGAs will require thermocouple sensor holes drilled through the PCB. AOI is effective at finding incorrect part placement, component presence or absence, incorrect orientation and polarity. A ‘first article’ inspection is performed on a run to ensure all SMT feeders are set up correctly and that there are no issues like worn vacuum nozzles or alignment of the vision system. Board assemblers can offer a special ‘First Article Service’ that enables a rapid and cost effective pre-production process by expediting a production of a few boards to designers for testing prior to a full run. Post reflow BGA inspection and testing, along with other leadless parts require special considerations as the component package shadows solder joints making inspection impractical without special equipment. 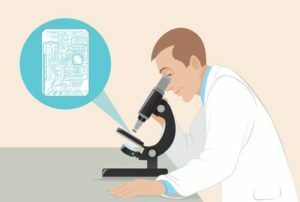 Inspection can be conducted by a range of devices including: computed-tomography (CT) scanning, specially angled optics microscopes, endoscopes and X-ray machines. A 3D X-ray machine is the most efficient solution to detect errors, enabling direct ball inspection to check for component misalignment, missing balls and solder deposition problems including thieving and bridging faults. There are limitations with the X-ray process associated with component overlapping and background metals can complicate image rendering. This should be considered during the design process. Post reflow testing includes: flying probe, custom test boards and bed of nails. All options have advantages and disadvantages depending upon production requirements, and carry different engineering costs and flexibility. Functions like software programming, analog component signature analysis and digital boundary scan automatic test equipment (ATE) can also be incorporated. Flying probe testing is good fo where a PCB test jig is prohibitively expensive. Flying probe has relatively low setup cost and a test procedure can be designed and implemented in a single day. Assembled PCBs with all components placed are compared electrically against the measurements from a golden board for verification. It can conduct open, short, orientation and component value circuit checks. This can help verify correct component placement and alignment. Flying probe does not perform power up testing or check for functional failures, and it is difficult to probe what cannot be seen. Care must be taken in placement of tall parts that may hinder probe access and that pads meet the minimum targeting requirements of the system.